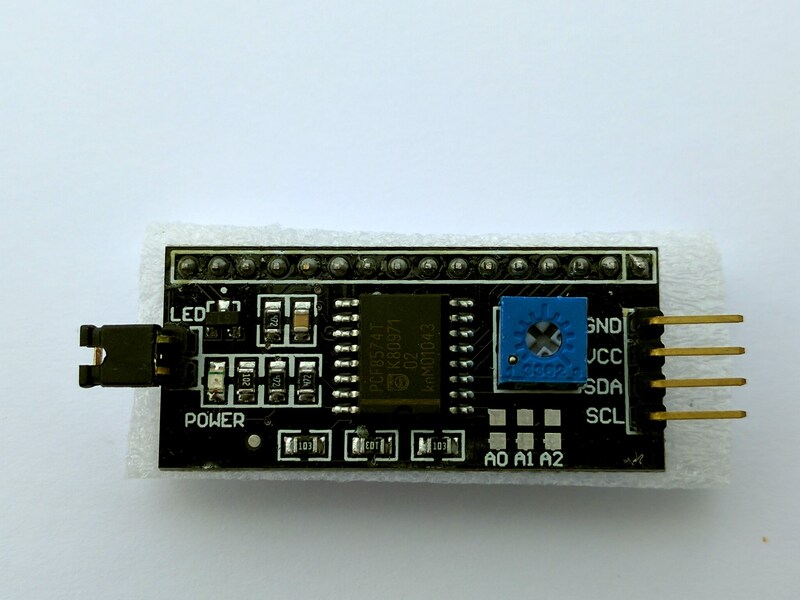 An Arduino LCD library using the PCF8574 I2C adapter. This is a library for driving LiquidCrystal displays (LCD) by using the I2C bus and an PCF8574 I2C adapter. The download the LiquidCrystal_PCF8574 library files includes an example. However all the standard examples should work also after adjusting the include file and classname to the library. The LCD Hardware that fits with this library is pretty standard. You can find manny of the HD44780 compatible LCDs and they come in many sizes like 20 character 2 lines and many colors. As long as they are HD44780 compatible (The name of the LCD controller chip) you can use them. The chip has the limit of displaying 4 lines of 20 character max. More details about this chip can be found at https://en.wikipedia.org/wiki/Hitachi_HD44780_LCD_controller. There you can also find a link to the chip manual with all the available commands and features. This is a picture of the PCF8574 module I use. The wiring of the PCF chip may differ with other adapter boards; the 8 output bits the PCF chip can be attached to the input chips of the LCD in various ways. There is no standard for this. If you like to adjust this to an adapter board with a different wiring you can do this in the internal function _write2Wire.